August 6, 2018 - Stocks Up as Data Comes In | OMH Partner Group, Inc. Domestic markets ended last week in positive territory, as the S&P gained 0.76%, the Dow was up 0.05%, and the NASDAQ increased 0.96%. This performance marked the 5th week in a row that the S&P 500 and Dow posted gains. Meanwhile, international stocks in the MSCI EAFE stumbled, losing 1.47% for the week. Once again, trade and corporate earnings were in the news last week. We learned that the U.S. is considering increasing tariffs on $200 billion of Chinese imports. In response, China announced their own tariffs ranging from 5%-25% on $60 billion of U.S. products. Corporate earnings season also continued, and so far, more than 78% of S&P 500 companies have beaten estimates. If the trend holds, the 2nd quarter will likely average more than 20% growth in earnings per share. Companies have also detailed positive perspectives for the rest of 2018, showing that this strong corporate performance should continue. Of course, last week's trade and earnings weren't the only topics on investors' minds. We also received a number of data reports that shaped our understanding of the economy's health. Consumers are earning and spending more. The latest data for personal consumption and personal income revealed both measures increased by 0.4% in June. In addition, the report included revised data from 2013-2017, which indicated that people earned $1.05 trillion more during that time period than initially thought. Tariff concerns are affecting manufacturing. The manufacturing sector continues to expand at a faster rate than in 2017, but the pace of growth slowed more than anticipated in July. Respondents to the ISM Manufacturing Index survey shared concerns about tariffs, steel and aluminum disruptions, and transportation challenges. The Federal Reserve is on track for a September rate hike. The Fed didn't raise rates this month, but projections show a 93.6% chance that it will do so in September. The latest jobs report detailed steady wage increases, which helped ease Fed concerns about inflation. 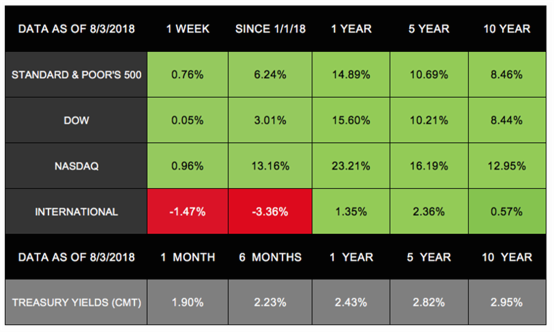 This week is relatively light on economic data, but we will continue to analyze last week's reports and the remaining corporate earnings releases. If you have any questions about where the economy is today or what may lie ahead, we're here to talk.